"What have the kapitalists done to us?" I’m just putting some lovely panels together for Oh Karen! #3, but I just had to post this absolutely hilarious panel featuring some strange Marvel attempt to be multi-ethnic. This is from issue #28 when Matt is away at a college lecturing about the legal problems that aliens from outer space would face upon arrival on Earth. Naturally, he has an encounter with actual aliens, of the evil invading variety whose weapon of choice is a mighty blinding ray. 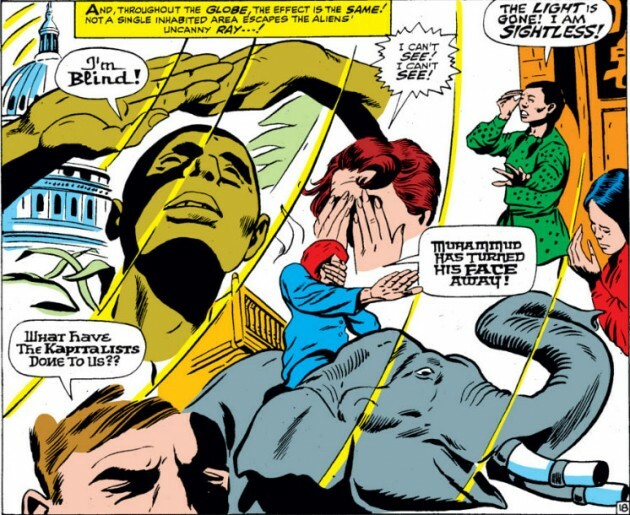 Well, you can’t blind a blind guy (well, actually you can and that happens in issues 30-32), but everyone else on the planet is affected, as illustrated by the panel below. My favorites are the Russian guy, going “What have the kapitalists done to us?” and the Indian and his “Muhammed has turned his face away!” Uhm, yeah… ‘Nuff said. "The way he dials that phone…"
"How I love the shape of your bald head"